A group of reunited college friends hear it through the grapevine in The Big Chill. 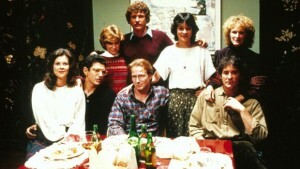 The 1983 comedy-drama The Big Chill focuses on a group of thirty-somethings who reunite for the funeral of one of their friends and end up spending a weekend together, reminiscing about their shared pasts as children of the sixties and confronting the uncertainty of their lives as adults of the eighties. Poignant and warmly humorous in equal measure, this baby boomer milestone made a star of writer-director Lawrence Kasdan (Body Heat) and is perhaps the decade’s defining ensemble film, featuring memorable performances by Tom Berenger (Inception), Glenn Close (Fatal Attraction), Jeff Goldblum (Morning Glory), William Hurt (Broadcast News), Kevin Kline (Queen to Play), Mary Kay Place (Being John Malkovich), Meg Tilly (Agnes of God), and JoBeth Williams (Timer). Co-opted a zillion times over the years (just as it took a helluva lot from John Sayles’ 1979 film Return of the Secaucus Seven, The Big Chill offers an impressive playlist of hit songs from the Sixties, all but inventing the consummately curated soundtrack.